Since I have started these web pages, I have had several inquiries about former 315th Bomb Wing Members from relatives; sons, daughters, nephews, nieces; requesting information about their relatives service in World War 2. If you have any information about the persons in question below, please send me an email at the address at the bottom of the page, and I will contact those seeking information, giving them your email address to contact. Randy Gradwohl - Looking for information about his father S/Sgt Jerome Gradwohl, 331st Bomb Group, 355th Bomb Squadron. Rob Williams - Looking for information about his father. 2Lt Harry D. Williams, Pilot, Crew 3011, 502nd Bomb Group, 430th Bomb Squadron. Jim Porter - Looking for information about his father. M/Sgt Richard W. Porter, a flight engineer in the 502nd Bomb Group, 411th Bomb Squadron, arrived Guam in July 1945. Candace Clark - Looking for any information about her father. James (Rich) Richardson A/C, 315th Bomb Wing, 16th Bomb Group, 15th Bomb Squadron. Richard West - Looking for information about his father, 1st Lt. Ellis A. "Red" West, 501st Bomb Group, 485th Bomb Squadron. Don Westman - Looking for information about his father, Sgt Ernest W. Westman, 501st Bomb Group, 41st Bomb Squadron. Becky Hecimovich - Looking for information about her father-in-law. Sgt Paul (Barney) P. Hecimovich, Special Vehicle Operator (MOS 932), 16th Bomb Group, 17th Bomb Squadron. Victory Jean, 44-83946, Slicker 51, Crew 7C2, Crew Chief - T/Sgt Edmond T. Pinckney Jr.
B 2Lt Henry L. Arkestyn Jr.
R Cpl. Charles H. Neal Jr.
GT Sgt Thomas L. Leinback Jr. I also found a reference from October 2002, that Frank Bush, a nephew of Lt Malcolm Morton (AC above), who was looking for more information. I emailed him in July, 2005, but didn't get a response. Brian Short is looking for information about his Uncle, Lt. Wayne Robert Shambrook. "On 10 March, the 501st Bomb Group had its first fatalities. A B-29, piloted by First Lieutenant V. Tulla, crashed while trying to land at Alexandria AAF, Louisiana. The ten-man crew was killed. It was a severe blow to their fellow group members, but the intensive training continued." Lt Shambrook was a crewmember aboard that aircraft. James Haggard is looking for information about his father. Sgt James C. Haggard, aircraft mechanic (MOS 747), 16th Bomb Group, 16th Bomb Squadron. Ross Rogers writes: My father, Col. Ross F. Rogers, was at Guam at the close of WW II. He was a LtCol then and had been an instructor at Barksdale. He recently died and I'm trying to find anyone who remembers him so I can learn more of his war experiences. He was a Material or Maintenance Officer there. 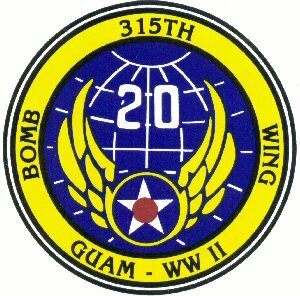 My father, S.Sgt John W. Stewart, Jr., known as Jack, was a member of the 355th Bomb Squadron on Guam. He said he was a tail gunner and that he was dropping bombs on Japan when the war ended, but he didn't talk much about his war experience, particularly that which has come to be known as The Last Mission, so I don't know much more than that. I wonder whether any members of my dad's squadron are still alive and, if so, how to get in touch with them so I can learn something about my father's war experience in Guam. For some odd reason, I'd really like to know whether his B-29 had a nickname.